The infamous Lantus has ported SDL to Xbox, making a BattlePong Xbox port possible! In fact, it has been done by bmy6063! Find it in all the usual hiding places for Xbox homebrew code. I wish I was notified earlier, so I could have added the news sooner. :) Thanks! 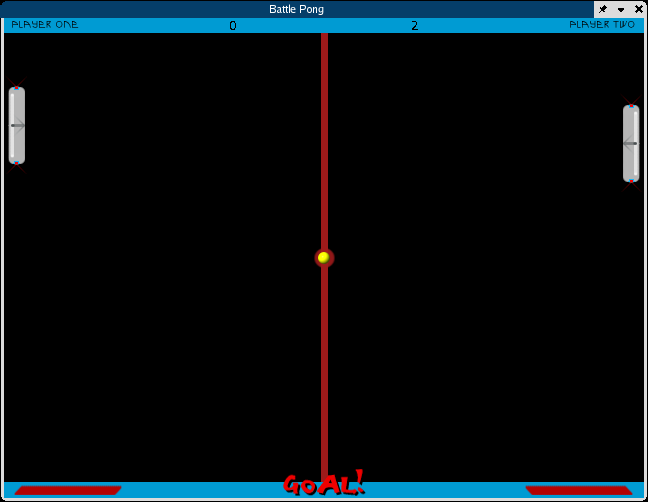 After a brief stint at SourceForge, Battle Pong gets a soul! We are very proud to become a part of icculus.org. I look forward to my future projects that will be hosted here. Long live Linux gaming. I'd also like to point out that we were mentioned on Slashdot by icculus himself. I hardly think that I'll be writing Unreal 3, but I understand what he was getting at. I have a lot to learn, so it'll probably be more like Unreal 20. Hey, if Rocky gets an unlimited number of movies, they can do it with Unreal as well. Anyhow, this release's major feature is KEYBOARD SUPPORT. WOW! A pong game that has keyboard support? Who woulda thunk it! Today I got an email from Andrew of Alpha Conspiracy, and he has given me permission to use the song Black Sunrise for the sound track. l33t! You can read the email by clicking here. The site has moved to SourceForge. Beta 2 has been released, and a new Windows binary will be uploaded shortly. I got word back from Robert of Machinae Supremacy, and he has given me the go-ahead to use their tracks Arcade and Masquerade for the Battle Pong sound track. W00t! You can read the email by clicking here. The source code for the game is now online. Make sure you read the documentation that is provided with it so you know how to make it work. Also, for the Windows users out there, there is a Win32 binary release up too. Battle Pong got a website! Development is nearing completion, and has come to a halt temporarily, due to time limitations. The only thing left to implement is the freeze missiles. Everything else is done and works nearly perfectly. 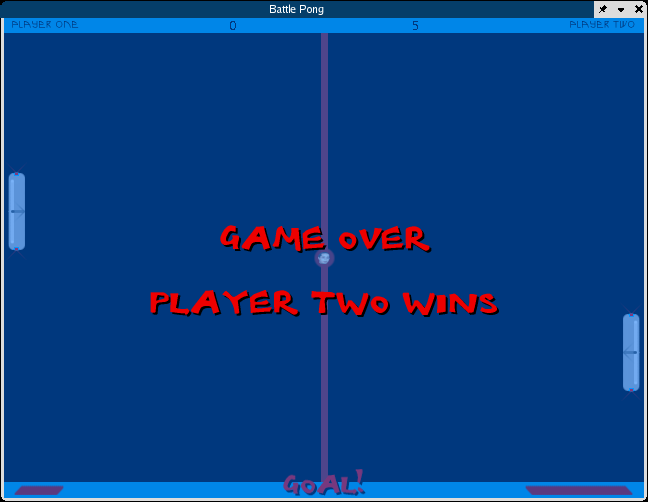 Battle Pong is now a fully functional Pong game, but without the Battle. 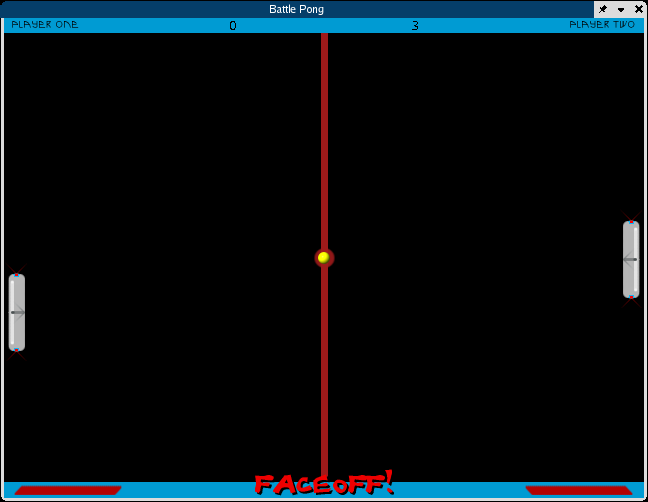 Development on Battle Pong has begun. I had to learn C++ nearly from scratch again, so I decided to teach myself as I went along. 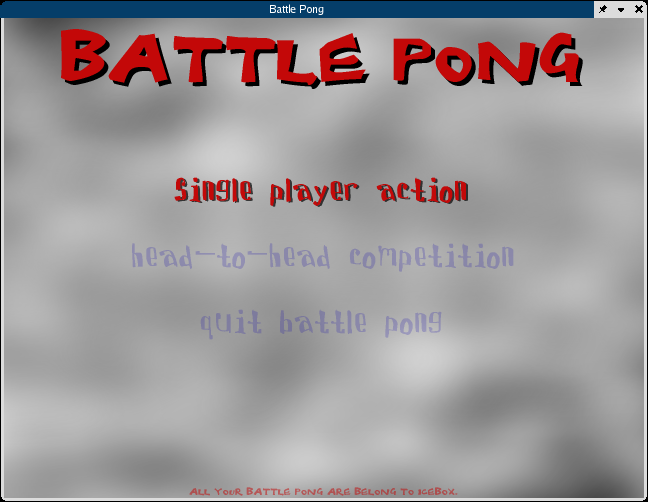 Battle Pong is a game that was developed by Scapegoat Software under Linux for the IceBox gaming console. It combines small elements of hockey and Mortal Kombat, in the form of faceoffs and opponent-freezing projectiles, with the classic game of Pong, which we all know and love. The game currently runs on Linux, Windows, and the IceBox, and can be played with either a game pad or the keyboard, as of beta 3. We recommend the Interact Hammerhead FX as far as game pads go. 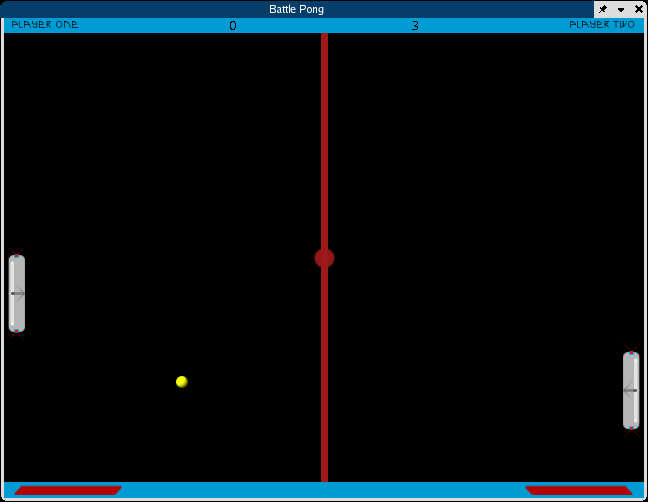 Battle Pong, in its current state, was developed in C++ with the SDL, SDL_image, SDL_ttf, and SDL_mixer libraries, in just under one week. It was a good learning experience for me, as I now know some C++ and some SDL. The IceBox is a Linux-based gaming console designed and implemented by Dana Olson, Ricardo Borrego, and Erik Harrison as a technical project for their computer networking engineering technologist college course. Both the IceBox specs and Battle Pong source code are licensed under the GNU Public License. This is the section of the site that shows the beauty of the game. Note that stills don't do the game justice, as you can neither feel the action nor hear the positional sounds. Download ISO for The IceBox (COMING SOON). - This must be burned onto a CD and run via the menu of the IceBox console. Download binaries for Linux/x86 (COMING SOON). - These binaries should run on most modern Linux systems. If they don't work, try compiling the source code. Download binaries for Win32 (~800KB). - This is a precompiled binary for the Windows users out there. I only provide it because I know how much of a pain it is to configure Visual C++ to compile properly, and some people may just want to play this game without having to compile it (probably not though, as it is just pong... It contains the needed DLLs as well, but the Ogg music must be downloaded separately (see below). Download the source code (~300KB). - If nothing else works, or if you want to look at the source yourself for learning or improvement, you should get this. Read the README file to find out how to compile this. Download the sound track pack (~8.5MB). - This contains the needed Ogg music files for beta1 to the current version. The README file tells you where to extract these files to. To visit the Scapegoat Software website click here. To visit the Simple DirectMedia Layer website click here. To visit The IceBox Project information website, click here. To visit the Ubuntu Studio Project website, click here. To visit Tux Games, click here. To visit icculus.org, click here. If you need to contact us, please email me at: dana@scapegoatsoftware.com If you would like to chat on IRC, I can usually be found in #icculus.org and #ubuntu-studio on irc.freenode.net.